Main card page: "Number 101: Silent Honor ARK"
Cannot be destroyed by battle except with "Number" monsters. 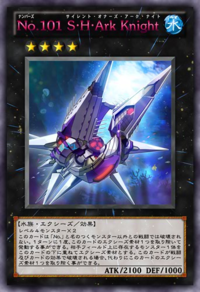 Once per turn: You can detach 1 Xyz Material from this card; attach 1 monster your opponent controls to this card as a face-up Xyz Material. If this face-up card would be destroyed, you can detach 1 Xyz Material from this card instead. This page was last edited on 24 September 2017, at 06:17.